I’m afraid this deep purple, 120-page meditation on the author’s insomnia does contain that paragraph. If, reading it, you think, ‘Yes, that’s exactly what inhabiting my house feels like’, you’ll love this book. If you can’t read those words without envisaging them in Pseuds Corner, you won’t so much. I fall into the second category but, as a part-time insomniac (alternate good and bad nights, ‘bad’ meaning wide awake from 3am to 5am), I did find a great deal to enjoy and nod my head at here. 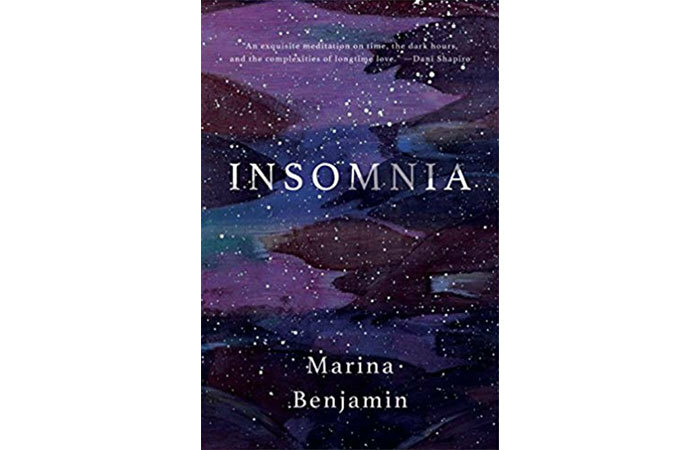 Marina Benjamin does her best to evoke the strange, tragicomic distress of insomnia, the loneliest condition on earth; almost lonelier if you are not actually alone but sleeping in the same bed as someone else who is sleeping soundly. The nickname Benjamin gives to her partner for the purposes of this meditation is ‘Zzz’. That’s what he is: asleep. When they first started sharing a bed, she remembers, they were ‘like the ancient landmass of Pangea, fused into a single state of being’. But slowly ‘continental drift set in’. Now she longs to ‘buy a ticket to sail over to his continent’. The loneliness of insomnia, she writes, when ‘my island self floats alone in a sea of night’, is ‘not even a dignified loneliness, because in insomnia you are cannibalised by your own gnawing thoughts’. Yes, we insomniacs know all too well that absurd cycle of thoughts or, as Benjamin puts it, ‘the night-time regurgitation of daytime crud – of the stuff that doesn’t actually merit deliberation’. Those thoughts ‘kick their way into your consciousness like an arm-linked chain of cancan dancers’. I hadn’t thought of the cancan dancer analogy but, now she says it, there is a Moulin Rouge brashness about the way those thoughts not worthy of deliberation keep high-kicking their way in. What do we think about books with white space between each paragraph? This is one of those. I think it’s a clever ploy, because it allows a writer suddenly to change subject and, in so doing, to sound philosophical, like Pascal in his Pensées. If the paragraphs in this book ran straight on from one to another, they would sound unforgivably non-sequitur-ish. I feel the space-between-paragraphs ploy makes a book a bit too easy to write, because you can get away with not thinking thoughts through. You can just let them hang there, in the white space, and move on. Benjamin takes us on whimsical digressions, such as to the story of Sleeping Beauty and Burne Jones’s Briar Rose at Buscot Park, or to Nabokov’s efforts to find out how dreams were created, or to the slave trade, or to Shakespeare bequeathing his wife his second-best bed, or to whether Jews in 1930s Vienna inhabited a ‘shared dreamscape’. The white spaces after such digressions gives them a surprising amount of weight, even though, especially in that last example, I couldn’t understand what she was getting at. On the subject of insomnia itself, she is always spot-on. Of sleeping pills, she writes that you never wake from them feeling rested; you wake up feeling ‘heavy-limbed, lug-headed, one-dimensional’. Insomnia makes you feel ‘jet-lagged in your own time zone’. It makes you feel ‘contracted’, ‘hemmed into your own head and oppressed by the impenetrable dark’. She describes going to a cognitive behavioural therapy group consisting of 15 insomniacs who all were all pale and hunted-looking. ‘The energy in that room was as flat as days-old beer.’ I can well imagine. It’s both very funny and very sad. I had a night of particularly acute insomnia straight after reading this, tossing and turning and worrying about all the other insomniacs who must be doing exactly the same. As Benjamin puts it, imagining the fellowship of insomniacs ‘all imprisoned within these solitary cells of wakefulness’ – ‘some kind of party, this’.